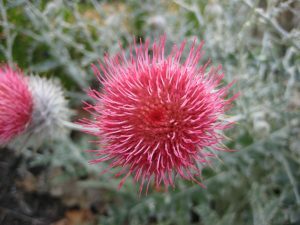 Western Thistle or Ghost Thistle is native to the mountainous regions of southern Oregon into California. Its frequently seen lining road cuts in recently disturbed very well drained soils. To 3′ tall and all white and cobwebby it produces deep magenta flowers on large candelabra type structures. Flowers appear in June and remain until August. Loved by pollinators as well as birds. Leave the structure to over winter and go to seed and you’ll get even more birds. Forms a rosette the first year and blooms the second. No summer water once established. Loves sharp drainage in average to slightly enriched soils. If you have clay amend the soil with pumice or plant on a steep slope. Avoid competition from other plants. Not a weed. Oregon native plant.